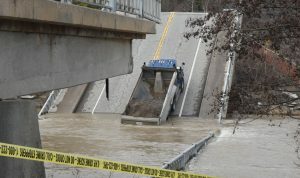 Elgin County councillors on Tuesday morning, March 13, ordered a temporary one-lane bridge installed to reconnect Port Bruce with Imperial Road, work that might be completed in as little as two months. The bridge would be able to carry a normal highway load, including heavy fire trucks. The bridge will go in to the east of the collapsed Imperial Road Bridge over Catfish Creek, where a former bridge was previously situated. More information to come in the Wednesday, March 14 print edition of The Aylmer Express. Councillors should be made to take a course in basic communication skills. There was no need to leave residents of Port Bruce completely in the dark for three weeks! Communication is KEY! Great News for those living in Port Bruce and for those operating a business..
Not for North Erie Marina. It will servery hamper their business. That’s all fine, but will the bridge be removed from the creek?? There are an awful lot of campers and boaters that need access to the lake from West of the bridge! And what about the truck? They are sitting on their ‘Hands’ ! County responsibility , plain and simple. Big changes come Election time in this area,put money on it! It will be nice not living at the end of the longest one way road in the county. Thought that might be the thinking all along. Certainly good news for the residents of Port Bruce but that will have a huge impact on operations at North Erie Marina. It would be nice if you give us a weekly report on the building of this temporary bridge on Bank Street. It is the middle of July, and there is nothing, no information on its progress since March that I can find. I want to go fishing in Port Bruce and have no idea if I can or not. I agree with the above comment about the Council keeping the public informed and not in the dark. How about an update please. There I said please so give us an update – an 8 X 10 glossy picture would be nice.